DeWalt DCS387B Reciprocating Saw - Is It As Good As They Say? 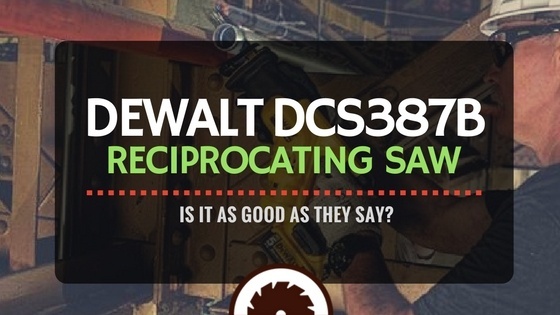 » DeWalt DCS387B Reciprocating Saw – Is It As Good As They Say? DeWalt DCS387B Reciprocating Saw – Is It As Good As They Say? Carpenters, plumbers, framers, and remodelers will find the DeWalt DCS387B Reciprocating Saw a valuable addition to their tool collection. With its versatile, compact and lightweight design, this powerhouse will make working in confined spaces a breeze. Tool-less blade changing functionality will ensure that your job is completed with a minimum of wasted time, while the cordless design will allow you the freedom to tackle a variety of projects both inside and outdoors. Cordless design makes the DeWalt DCS387B Reciprocating Saw compact and easily portable. Ergonomic design allows for skilfull maneuvering around tight and confined spaces. Vibrates excessively when in use. 73% more cuts per charge due to its lithium-ion battery. Ergonomic design enables the user to easily maneuver around, whilst a steady grip ensures accuracy with every move. Enjoy faster cutting with the 460 max watt motor. The DeWalt DCS387B Reciprocating Saw’s speed trigger delivers up to 3000 strokes per minute. Four position blade clamp enables flush cutting and makes blade changing easy and fast. Pivoting shoe provides leverage and extends blade life. The useful LED light provides lighting, handy when used in dark spaces. The DeWalt DCS387B Reciprocating Saw’s design is lightweight (weighs 7.3lbs), compact and portable which enables you to transport your tool wherever necessary and easily store it away when not in use. As the DeWalt DCS387B Reciprocating Saw’s battery is downward-orientated, the product is as a result, shorter and smaller. However, the lithium-ion battery is a powerhouse, offering 73% more cuts per charge when compared to older battery designs. This versatile, cordless saw has an ergonomic design which makes it easy to grip and operate, allowing for both accuracy and precision. Due to the ease of control and light maneuverability, the DeWalt DCS387B Reciprocating Saw can be operated with one hand, allowing for dexterity of movement and maximum functionality without making any sacrifices when it comes to speed. Whether this is your first purchase or your most recent upgrade, the DeWalt DCS387B Reciprocating Saw is a breeze to use whatever your experience level, thanks to its intuitive design and user-friendly speed trigger. Despite its cordless design, the tool will surprise you, with the power supplied more than sufficient to cut through most everyday materials. Thanks to the four position blade clamp, the cutting blades can be relied on for many years of repeated and happy use. The shoe pivots and is capable of flush cutting, which is an important feature for most personal and professional hardware tasks, providing you with increased control for tricky tasks. The shoe, however, does not adjust in and out, which is a limitation that may be frustrating at times. Much like all of DeWalt’s products, the DeWalt DCS387B Reciprocating Saw is well-made and surprisingly durable given its relatively competitive pricing. 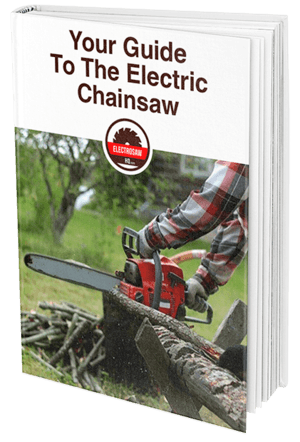 Due to the power supplied, battery usage may be less forgiving than other cordless reciprocating saws on the market, which is one of the biggest complaints to be leveled at the machine. The DeWalt DCS387B Reciprocating Saw makes blade changing seamless, and the blades are long lasting and can cut through most materials, including wood, nails and PVC pipe. The DeWalt DCS387B Reciprocating Saw comes with a limited three-year warranty; one-year free service and a ninety-day money back guarantee. The DeWalt DCS387B Reciprocating Saw is compact, lightweight and can be easily stored away when not in use. The cordless design makes cutting in small or awkward places more attainable. The ergonomic grip allows for more accuracy and greater control, as well as increased comfort and therefore greater stamina, ensuring that most jobs can be completed in one attempt. The DeWalt DCS387B Reciprocating Saw is more powerful than its corded predecessors, although this added power comes at the expense of greater vibrations. However, these should not hamper your enjoyment of the product or ability to complete your chosen project, particularly if gloves are used, which is recommended. The DeWalt DCS387B Reciprocating Saw is offered at a price point that is great value for money. While not the first choice for those customers seeking a bargain option, when compared to other reciprocating saws on the market, DeWalt’s DCS387B is extremely competitively priced, given its practical design, multiple use potential and powerful yet compact motor. This product has a long lifespan and, even when used daily, will provide you with many years of cutting excellence and will surely be a valuable addition to any toolbox or serious workshop. This is a bare tool and batteries are not included. The DeWalt DCS387B Reciprocating Saw is readily available online from most reputable dealers and includes free shipping to selected countries worldwide. The Black+Decker BDCR20B 20v MAX Lithium Bare Reciprocating Saw also features a tool-free blade changing system, much like The DeWalt DCS387B Reciprocating Saw. It also has a variable speed trigger and an intuitive pivoting shoe design for ease of use. 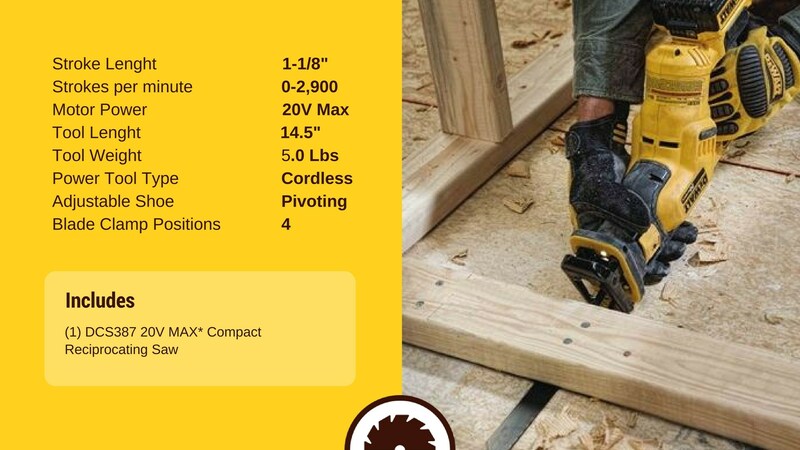 However, the shoe does not adjust in and out, a design feature, which is mirrored in the DeWalt DCS387B Reciprocating Saw. 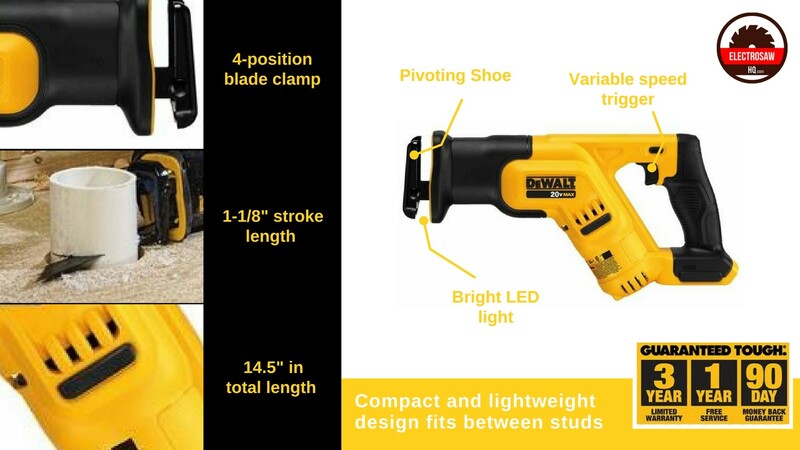 The maximum initial battery voltage is also 20 volts like the DeWalt DCS387B. The Black+Decker BDCR20B 20v MAX Lithium Bare Reciprocating Saw is in the same product range as the DeWalt DCS387B Reciprocating Saw and also offers 0-3,000 strokes/minute. The Black+Decker BDCR20B 20v MAX Lithium Bare Reciprocating Saw is a longer product that is lighter than the DeWalt DCS387B Reciprocating Saw, however, due to its length may not be as easy to move around in tighter, more awkward spaces. This is a bare-tool item - battery sold separately (not included). The Bosch CRS180B 18-Volt Reciprocating Saw is an efficient and effective unit. The Bosch CRS180B boasts a compact tool length and lightweight body of only 7.6 lbs, which is slightly heavier than the DeWalt DCS387B Reciprocating Saw which weighs 7.3 lbs. The Bosch CRS180B 18-Volt Reciprocating Saw has been precision designed to handle heavy-duty cutting in a variety of less than hospitable areas, much like the DeWalt DCS387B Reciprocating Saw. This saw has only two-speed settings, unlike the DeWalt DCS387B which has a multiple speed setting that can be easily adjusted on the trigger for added convenience. While the Bosch CRS180B 18-Volt Reciprocating saw is also a good choice for uncomfortable or hard to reach cutting jobs, its length may not provide as much ease of rotation as the DeWalt DCS387B Reciprocating Saw, potentially limiting its efficacy in the trickier conditions. This is also a bare-tool item - battery sold separately (not included). The M18 SAWZALL Reciprocating Saw offers top of the range durability, speed and 50% more run time than competitors such as the DeWalt DCS387B Reciprocating Saw. The Milwaukee M18 SAWZALL Reciprocating Saw provides ultimate performance and promises up to 30% faster cutting. The slim front-end design provides improved ergonomics, offering maximum comfort and control, much like the DeWalt DCS387B Reciprocating Saw. The Milwaukee M18 SAWZALL Reciprocating Saw includes a counterbalance mechanism, which reduces vibration, offering more control and less fatigue on your hands and wrists as well as allowing you to operate the machine without the need for gloves. The Milwaukee M18 SAWZALL Reciprocating Saw is protected by a 5-year limited Milwaukee warranty, which is longer than the three-year warranty offered by DeWalt for the DeWalt DCS387B Reciprocating Saw. Like all of the tools in the comparisons, the M18 SAWZALL is also a bare-tool item - battery sold separately (not included). Carpenters, plumbers, framers or remodelers who often find themselves having to saw in tricky situations or tight, uncomfortable areas will be relieved of this hassle with the DeWalt DCS387B Reciprocating Saw. The DeWalt DCS387B Reciprocating Saw provides a variable-speed trigger, easily adjustable to allow you to effortlessly saw into almost any material. The LED light is useful for navigation and additional visibility and is an often overlooked feature that can prove critical in many professional settings. This cordless tool delivers a 1-1/8-Inch stroke, allowing more material to be removed per stroke. The power-to-weight ratio for the DeWalt DCS387B Reciprocating Saw is impressive, outplaying many older corded saws on the market. The DeWalt DCS387B Reciprocating Saw provides an ergonomically shaped handle with a soft-grip zone for additional comfort and ease of control and precision.